Forward references to functions are generally not allowed; in other words, you should always define a function before calling it. However, in the same <<script>> tag within which a function is defined you will be able to forward-reference a function. This is a very poor practice and should be avoided. Functions do not have to receive only literal values; they can also be passed variables or any combination of variables and literals. Consider the function here named addThree that takes three values and displays their result in an alert dialog. You would see that type conversion would result in a string being displayed. Using the typeof operator, we might be able to improve the function to report errors. We’ll see a number of other ways to make a more bullet-proof function later in the chapter. For now, let’s concentrate on returning data from a function. Functions always return some form of result, regardless of whether or not a return statement is included. By default, unless an explicit value is returned, a value of undefined will be returned. While the return statement should be the primary way that data is returned from a function, parameters can be used as well in some situations. 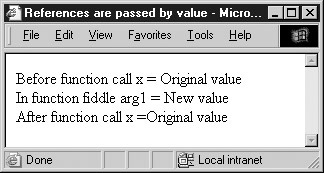 Notice that the function fiddle does not modify the value of the variable x because it only receives a copy of x. Unlike primitive data types, composite types such as arrays and objects are passed by reference rather than value. For this reason, non-primitive types are often called “reference types.” When a function is passed a reference type, script in the function’s body modifying the parameter will modify the original value in the calling context as well. 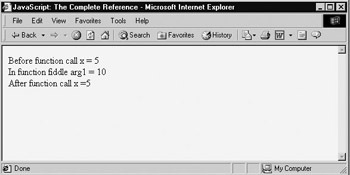 Instead of a copy of the original data, the function receives a reference to the original data. Consider the following modification of the previous fiddle function. This is “pass by reference” in action. A pointer to the object is passed to the function rather than a copy of it. Of course, you could also use a return statement to pass back a new value instead. If this discussion went over your head, don’t worry; it’s rather advanced material. Just keep the following rule in mind: functions passed reference types can modify but not replace values in the calling context.